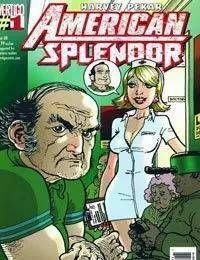 In 2006, comics legend Harvey Pekar brought his unsparing tales of ordinary life to Vertigo with an all-new run of AMERICAN SPLENDOR, the comic that, 30 years earlier, rose from the streets of Cleveland and changed how we look at comics. Often imitated but never duplicated, Pekar proved that he still has the power to make mundane reality seem like the highest drama (Entertainment Weekly) in his critically acclaimed Vertigo series. Now, Harvey Pekar is back with an all-new series of AMERICAN SPLENDOR, featuring his funniest, most poignant, somber and uplifting stories from the complex life of an ordinary man. Once again, the Vertigo AMERICAN SPLENDOR pairs Harvey with some of the most exciting, innovative artists currently in comics, including in this special premiere issue, David Lapham (YOUNG LIARS, Stray Bullets), Chris Weston (THE FILTH, Fantastic Four), Dean Haspiel (THE QUITTER, Brawl), Mike Hawthorne (THE UN-MEN, Queen and Country), John Lucas (THE EXTERMINATORS) and other luminaries from both the mainstream and indie worlds. In this issue, they join Harvey to chronicle his battles with stubborn sofas, short sighted magazine writers, treacherous front doorsteps and many more obstacles for Harvey to overcome in his pursuit of a fulfilling and meaningful existence.